What if I told you that TIME was all in your head? Whether you believe you never have enough of it, it’s quickly running out, or even that it’s on your side it’s really all just a creation of your imagination. Of course you’re not the only one that feels this way. Time is something we can all agree on, so that means it’s real, right? Well whether it’s real or not can be debated. But what is for sure is that the way we use it and experience it is different for everybody. Collectively, time is unifying. It brings us together. We use it to look back at our collective history and to look forward at where we want to be in the future. It reminds us of traditions and helps us plot out events to take place in the distance. In his book “Stumbling on Happiness,” psychologist Daniel Gilbert refers to this as the act of “making future.” We are the only species on Earth that can do it…and, he suggests, it is the human brain’s greatest achievement. “To see is to experience the world as it is,” he begins, “to remember is to experience the world as it was, but to imagine — ah, to imagine is to experience the world as it isn’t and has never been, but as it might be.” It’s called prospection: the act of looking forward in time or considering the future. And it is a trait, completely unique … to us. The same incredible ability to look forward and imagine the future also allows us to look back at our past. Our memory allows us to find events at will in the database of our mind, recover them, analyze them, and draw conclusions from them. These conclusions are what we will use as aids in making our future decisions — our past serving as an unlikely but very common compass for our future. But when you look at time this way and the way you use it to view yourself, your decisions, and the world around you … consider what is always missing. NOW. The present is something we almost always overlook. Why? What are we missing? Psychologists like Gilbert would argue that when we view life only as what happened or what we want to happen next that we’re missing out on happiness. Our natural distortion of time worsens our experience. Analyzing areas of difficulty in the past and using them to chart the actions we imagine for our future can not only be detrimental…but flat out paralyzing to our bliss. In Paolo Coelho’s Aleph he uses an old Oak Tree in his yard as the perfect metaphor for gauging time and wisdom. 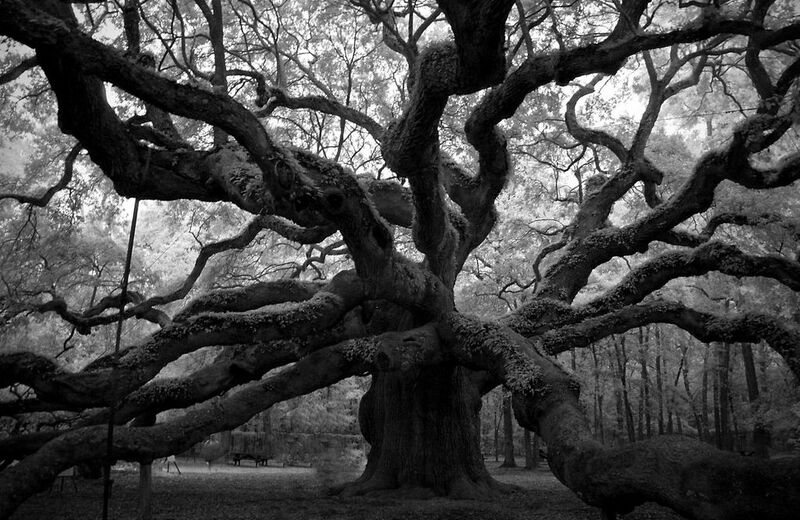 The oak tree is over 400 years old, majestic and overwhelming. He stares at it, remembering a time when it once brought him awe and astonishment, when he was younger and thinking about the power that must come with time, wisdom, and experience. But now as an older man himself he realizes that this great oak hasn’t learned much in 400 years — other than how to stay only in one place. “Time doesn’t teach,” a mentor tells him, “it merely bring us a sense of weariness and growing older.” This may be why after a few failures in life we start to delay decisions and attempt to “control” time. It manifests and transforms the way we view others around us, even the world which we see not necessarily as it is — but again as a creation of our own mind. It’s shaped by a confusing mix of our own personal experiences and the persuasions of others around us. Then it becomes “the way” that we filter life … again the compass we use to chart our path for the future. Despite our ability to imagine happiness, to construct an optimistic view of the future — many of us instead fall too easily into the rut of negative thoughts. It’s in our DNA, engrained in our evolution. From our ancestors thinking negatively, analyzing the dangers and failings of the past and trying to minimize risk is what kept us safe, but also alive. 75 – 80 percent of the average human being’s thoughts are negative…even on a good day. So even when we are hopeful about the future (or tell ourselves we are), we often self-sabotage that happiness by overlooking the most important part of it…the present. The present, the now, IS the key. Many great Eastern spiritual teachers believe that the present moment is eternity…it’s “karma.” Not the way we all often mistake the word or its meaning.Past and future exist nowhere else but in our mind and the only way to change our future is to ignore it and the dangers from our past. What you may find here is that despite thinking about all of the things that happened to you and all the things you want to happen in your future that in the present you feel calm and peace. Whether we’re past or future oriented we have a tendency to identify ourselves with either…often both. 1.) Witness your thoughts: don’t try to “quiet” or “shut out” your thoughts. Instead experience your own inner thoughts as you would noise. In other words…allow for separation from your thoughts without trying to eliminate them. 2.) Re-Identify yourself: Most of us identify ourselves with our thoughts. This is especially dangerous when we use our past as our guiding force. This means that we identify ourselves as our past, the “inner voice” that’s constantly talking to us in our mind. You’re much more than your inner dialogue. 3.) Just Breathe: Take a moment and pay attention the way you breathe. Focus on each breath as it goes in and out and how it seems to take shape and move through your whole body. Anybody that enjoys yoga would probably agree with this one. 4.) Enjoy Music: Music may actually be the language of the world. It resonates in us, it actually has a positive effect on the cells in our body…nourishing them and allowing them to repair themselves after times of stress. I remember years ago doing a story for a Children’s Hospital and in interviewing Music Therapy specialists they explained to me the way that music will actually merge with the body. It syncs with our not only our heart beat but also our brainwaves. Softer, soothing music was used by these therapists to improve motor functions and speech patterns in children who will never walk or talk like you or I. However, their work was proven to increase not only the lifespan of these children…but to provide them with an overall better quality of life. 5.) Peace of Mind: It’s called “Mindfulness.” Much like tip # 1, it’s the art of being aware. While you are distancing yourself from your thoughts make the effort to observe life around you. This doesn’t just mean when you’re out in nature or around a lot of people that you can observe. It means taking notice of your actions and all of the experiences around you…RIGHT NOW. As I write this, I’m taking notice of the way my fingers feel when they hit the keys and the sound it makes, etc. You can do this anywhere. 6.) Act Against Routine: If we identify ourselves with our thoughts and in our thoughts we only analyze our past and use it to predict the future then we get stuck in a routine that is crippling. Take action, when you feel a “routine” forming, including in your thought pattern then act AGAINST it. Do what is not intuitive but counter-intuitive. “The definition of insanity is doing the same thing over and over again but expecting different results,” said Albert Einstein. I agree. You might realize that the rest was all in your head…it was just your imagination. ~ by Dan Fabrizio on December 4, 2012.